We all “feel the effects of war in this country, whether we realize it or not,” filmmaker Michael Collins told Social Workers Speak about his film, “Almost Sunrise,” which details the life-changing trek two Iraqi-war vets take to highlight Post Traumatic Stress Disorder and it’s cousin, moral injury. In addition to experiencing the horrors of serving in Iraq, the subjects of the film, Anthony Anderson and Tom Voss, suffer PTSD and moral injury and are unable to assuage the feelings of guilt about their actions overseas. How do you weigh the moral dilemma associated with what you’ve done as a soldier —even though they were simply following orders? It’s not an easy question. Some returning soldiers are able to manage but many are not. According to the film, some 22 veterans commit suicide daily. 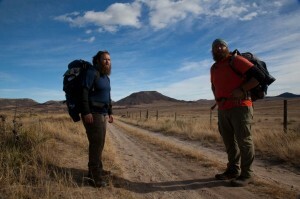 To bring attention to this plight and to deal with the aftermath or war, Voss and Anderson allowed filmmaker Michael Collins to follow their 2,700-mile walk from Milwaukee, Wisc., to Santa Monica, Calif. Both went on a physical, spiritual, and meditative journey that helped them cope with their lives as soldiers and the juxtaposition of trying to return to normalcy back home. Social Workers Speak chatted with Collins, a filmmaker for 12 years, about the film and its importance to social workers, who are often on the front lines of helping returning soldiers cope with life after war. Q: What was the impetus for the film? Collins: Back in 2012, I was volunteering for a veteran’s organization creating a video. One particular day, my interview subject casually mentioned, “Twenty-two veterans kill themselves every day.” It stopped me dead in my tracks. I thought I had misheard. I didn’t. That was a pivotal moment for me in this journey to make this film. I realized that there was a crisis in this country, taking place right in front of our eyes, one to which many of us, including myself, were blind. In that moment I knew my next film had to be about the veteran and military family experience. I wanted audience to have the opportunity that I was having, to hear their stories, walk in their shoes, and feel that connection and sense of responsibility to tackle these issues they are facing, together. Q: The men started in Milwaukee, Wisc., and ended in Santa Monica, Calif., trekking 2,700 miles for 155 days. How many states did the men cross total and did any other vets join them for any considerable length of time along the way? Collins: They went through seven states: Wisconsin, Iowa, Nebraska, Colorado, New Mexico, Arizona and California. From a filmmaking perspective it was wonderful to see nearly every terrain and landscape this beautiful country has to offer and across many seasons. The American landscape itself is a character in the film. Other veterans would come out and join them for limited stretches of the walk to show support, and to experience their own healing. The guys would always talk about how much they learned from Vietnam vets in particular. How their experience and advice was part of what inspired the walk in the first place—to go and face their demons now rather than waiting 40 years until their lives had passed them by. Scene from Almost Sunrise. Photo courtesy of filmmakers. Q: Had you heard of moral injury before filming? Collins: I always knew that I wanted this film to go beyond talking about PTSD — to be looking ahead and starting a new conversation but I wasn’t sure of exactly how. It was shortly after the trek began that my director of photography, Clarissa de los Reyes, sent me a link to an extraordinary three-fold article by senior war correspondent David Wood in The Huffington Post about moral injury. It was so eye opening and really helped shape the vision for the film. Q: The profanity, the images from the theater of war in Iraq, the visceral flashbacks of bodies blown apart by war —was it your intention to truly show how much suffering these young men face when they see the horrors of conflict and what the fear, anxiety, flashbacks and depression is like to further illustrate how much the experience of combat can change a person? Collins: The brief, yet explicit images of war are to give the audience a look at some of the more psychologically and spiritually damaging implications of combat exposure; going beyond the typical PTSD and (traumatic brain injury) TBI we tend to associate with deployment wounds. I didn’t want to sugarcoat it (and have been thanked by veterans a number of times for that after they watch the film). But I also did not want to be gratuitous, which is why these images only come as flashed during one sequence. It’s impossible for us to ever truly know what soldiers experience, but I wanted to use the power of this medium to get us a little closer. To take an unflinching look at what it is we are asking our service members, and thereby their families. To wake us up to the reality that there is a cost far greater than we typically acknowledge to sending young people into battle – and we need to take responsibility for their successful transition back into civilian life as a community, particularly if the government is falling short. Q: The film points out that although taking medication can reduce the fear, it’s the guilt and shame that leads to moral injury although these men are doing what they are trained to do and following orders. Do you think that’s a critical element social workers should consider when they’re addressing how to treat returning veterans who are still experiencing the internal struggles of their actions during combat? Collins: Absolutely. It has been such a gift for me to witness so much healing as I’ve worked on this film. I’ve met veterans who’ve told me that they’ve slept a full night for the first time in decades [and] that they got off their meds for the first time in 40 years. That they felt like themselves again—all after participating in what was once considered “alternative” treatments such as the Power Breath Meditation Workshop. Q: Why should social workers see this film? Collins: Social workers are on the front line; they play such a vital role in the healing journey for veterans and their families. The film really spotlights the complexity of the veteran experience and what the family goes through when they return. It takes the conversation far beyond PTSD and fear-based trauma to the nervous system. It dives into the wounds to the soul; the moral injuries that are more nuanced and require special care and attention to heal. Social workers, like veterans, are driven by service. I think any opportunity to dive deeper into the experience of those we serve, to walk in their shoes and get a glimpse of the world from their perspective—ultimately empowers us. Recently we were invited to participate at the NYU Silver School of Social Work “Social Work with Military Personnel, Veterans and their Families” Conference showing the film and participating in a Panel discussion about Moral Injury. It was one of the most dynamic conversations and question and answer sessions I’ve participated in. The response was overwhelmingly positive and has led to a number of new opportunities including a partnership to have targeted screenings within the Veterans Affairs system across New York state. Benjamin Sher, who organized the conference said, “What a triumph … the film was the focal point at the conference.” In fact because of the success and the clear alignment in missions, we now have two social workers on our campaign advisory board. Together we plan to create opportunities for many more social workers to engage around the film and invite anyone to reach out to us who would like to host a screening on our website. Q: How do you think social workers can best help veterans after seeing this film? Collins: The film explores how traditional treatments alone don’t always reach the depths of this pain, and points to other evidence-based paths of healing. This is one aspect of the film that has been resonating with many social workers. To best help veterans, I would just reinforce what social workers already do by being committed to highly customized care, and being open to all possible courses of treatments. We’ve also had some social workers express an interest in wanting to share the film with their veterans and military family members in their care, so we are exploring different ways to do this together. Q: Did you have a hope that social workers and viewers would learn something about moral injury? Dr. William Nash, Director of Psychological Health for the U.S. Marine Corps has said, “I would bet anything, that if we had the wherewithal to do the research, we’d find that moral injury underlies veteran homelessness … and suicide.” It is moral injury, not PTSD, which experts believe will eventually be known as the defining wound of this generation of veterans. 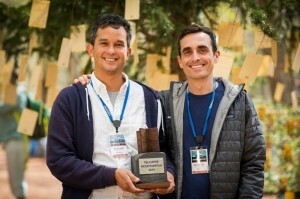 Almost Sunrise filmmakers (left) and Michael Collins. Photo courtesy of filmmakers. Q: After filming both Anthony and Tom’s journeys – physical and spiritual – would you say that meditation is certainly something the military should consider as a treatment for moral injury? Collins: Yes, these methods are evidence-based and while some (Veterans Affairs centers) are finding ways to offer them it is not the norm. As long-time meditator myself I’ve seen first hand the benefits of these practices. But through this journey I’ve also come to learn that for many veterans a breath-based meditation practice tends to be more effective than more traditional mindfulness techniques because vets have so much trouble quieting their mind. Q: Where are Tom and Anthony now? Collins: The guys are living in the Milwaukee area and living life to the fullest. Anthony and his wife Holly have moved a little further into the country to raise their young daughter closer to nature. Tom is now working full time for Project Welcome Home Troops helping to bring the Power Breath Workshop, which was so transformational in his own life, to veterans all over the country. Q: Tom talks about the power of forgiving himself. He went through something really intense during the power breathing session. In your opinion, do you think this type of meditative therapy can really help someone suffering moral injury? Collins: I was actually in the sitting right behind Tom when he had his “breakthrough” moment during the Power Breath Workshop. So yes, I do believe in the power of these practices. But moral injury is extremely complicated and everyone’s experience is different, therefore paths of treatment need to be customized. This is why I’m so grateful for the role social workers play in the veterans healing journey, and hope that more of the holistic therapies work their way into the mainstream. Social workers help people, including veterans and their families, overcome life’s hurdles. To learn more visit the National Association of Social Workers Help Starts Here website. What is the process for having this film shown locally and having a discussion group on the film facilitated by a professional working with veterans? 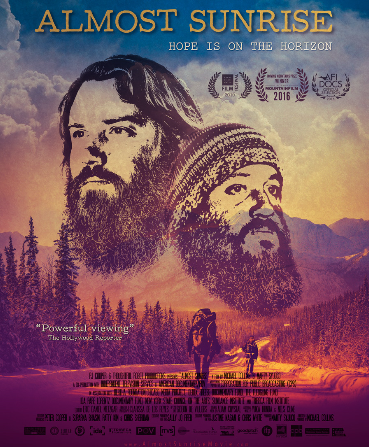 Please go to the filmmakers’ website (http://sunrisedocumentary.com/) to get information on screening the film in your area and resources. They may also be able to give you resources to have a discussion after the film. I really enjoyed this post. I think our culture is not quick to think about morality period; thus, it is not surprising that it follows we wouldn’t jump to the effects of of moral injury. This fascinates me. I think pre-moderns, who had things like Plato’s “form of the good” on their minds, would be quicker to think about the effects of “immoral” action, whether intentional or unintentional, on our very being. Sometimes, it seems shockingly more holistic to think in this pre-modern way than in our post-modern way. I hope to watch Almost Sunrise soon! I work for a podcast called inSocialWork®, and they have had some other helpful podcasts that have helped me think about Veterans and the effects of these traumatic events. I think a podcast on moral injury would be really interesting. Something we will keep in mind! I have included the link to all of our veteran episodes, if any of your readers are interested. Caitlin, thanks so much for your thoughtful comment and sharing the link to inSocialWork® podcast!